Pixie Play School "Summer of Fun" will be offered in 3 sessions Tuesday, Wednesday, Thursday from 9AM -12PM. $120 per session with $10 discount if you sign up for 2 sessions and $20 discount if you sign up for all 3 by May 1st. Parent or adult family member participation in the classroom is required, frequency will be dependent on enrollment. Please go to www.pixieplayschool.org for more information or to contact us. Holidays: We follow the Mount Diablo School District calendar. We enroll throughout the year, depending on availability. Please call the school to speak with our Membership Coordinator, then take a tour and complete the necessary paperwork. 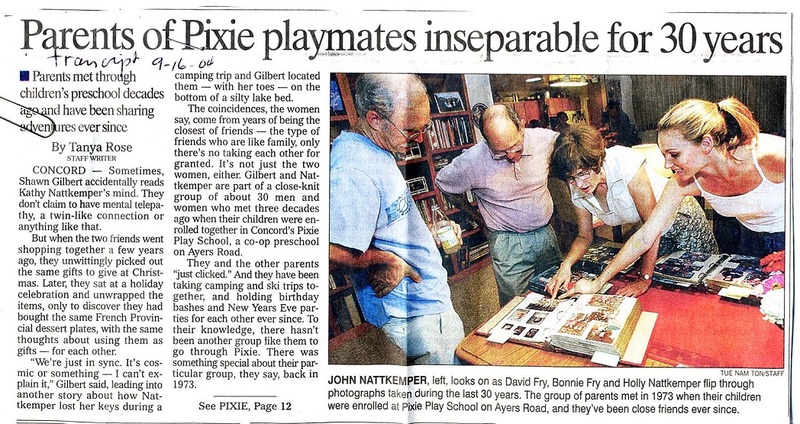 Pixie Play School just celebrated its 50 year anniversary. Pixie Play School - Our philosophy is based on the knowledge that children learn through play. We respect each child's uniqueness and allow them to grow at their own pace. We provide a safe and nurturing environment that allows children to develop in all areas: socially, emotionally, cognitively, linguistically and physically. Our goal is to instill a joy in learning that each child will carry throughout their life. - You, the best expert on your child, are in the classroom. - You are supported by the expertise of a professional teacher who plans the curriculum and guides the program. On a regular basis you will be able to see first hand how your child interacts with his/her teacher and playmates. Co-oping also opens the door to many friendships as you interact with other parents and grandparents and with an adult to child ratio of 1:4 your child gets lots of individual attention.